A well-known photograph taken before U-47's departure to Scapa Flow on 8 October 1939 shows a drawing on the starboard side of the patchy conning tower. 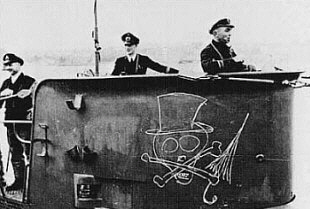 This drawing, of a skull and crossbones adorned with a top hat and umbrella, mocked the British Prime Minister Neville Chamberlain. Other U-boat insignia, such as those which adorned the towers of U-46, U-53, U-56, U-58, U-60 and U-61, also at some point included caricatures or references to Chamberlain. Left: Taken on 8 October 1939 at Kiel, this well-known photo is the only photo in general circulation which shows the temporary Chamberlain drawing. Right: a schematic of the Chamberlain drawing. None of the books in general circulation provide details of when the drawing was made, nor for how long it remained on the tower. Neither is it clear whether a similar drawing was present on the port side of the conning tower. 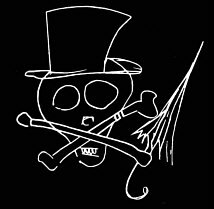 Some commentators have suggested that this temporary insignia was an improvised chalk drawing, which would have in all likelihood been washed away during the first dive made by the boat. Others suggest that the drawing was produced with a tin of white paint, just like the snorting bull insignia a week later. If the latter is correct, then the Chamberlain insignia may still have been on the conning tower during the attack on HMS Royal Oak on 13/14 October 1939. However, these debates are mere speculations. The only clear, incontestable fact surrounding the Chamberlain drawing is that it was present on the starboard side of U-47's tower on 8 October 1939. U-47 returned to Germany from the infamous Scapa Flow raid during the period between the 14th October 1939 and the 17th October 1939. During the return journey, an insignia consisting of a white outline of a snorting bull was painted on either side of the boat's conning tower. Subsequently known as the "The Bull Of Scapa Flow" (Der Stier von Scapa Flow), the insignia became arguably the most famous of all U-boat insignia. Numerous paintings and illustrations depicting U-47 during the Scapa Flow attack on the night of 13/14 October 1939 include a bull on the U-boat's tower. As the bulls were applied during the return to Germany, which took place between 14 and 17 October 1939, these illustrations are erroneous. Left: A close-up of the original 'snorting bull' insignia, painted on the conning tower of U-47 following the sinking of the Royal Oak at Scapa Flow in October 1939. 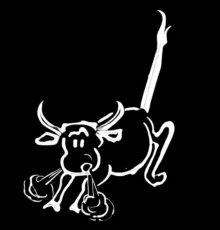 Right: A schematic of the first bull design. 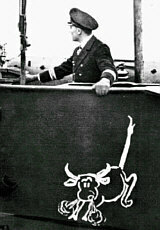 The bull insignia was devised by U-47's First Watch Officer, Oberleutnant zur See Engelbert Endrass. The first of the three influences which prompted Endrass to produce the bull insignia was a comment made by the Second Watch Officer, Oberleutnant zur See Amelung von Varendorff, during the time U-47 had been cruising around on the surface inside the Scapa Flow harbour. The young officer had just been chastised by Prien for taking a stroll on the deck without signing himself off the bridge. Upon reporting back to the tower, von Varendorff remarked, "Herr Kaleun, there is nothing wrong in this bullfighting arena; where are the war horses?" The second influence came from a character in a comic paper that was popular among the crew before the Scapa Flow raid. The character, "Harry Hotspur", was a bull with smoking nostrils which hoofed the ground. Lastly, it was felt that the insignia depicted the aggressive character and spirit of U-47's legendary commander, Günther Prien. With these three influences in mind, Endrass designed the bull on the way home to Germany from the successful Scapa Flow mission. Bootsman (Chief Petty Officer) Hans Sammann and Matrose Gefreiter (Able Seaman) Peter Dittmer enlarged the drawing and made a stencil from paper. Using this stencil, the white outline of a snorting bull was painted upon both sides of U-47's conning tower. Günther Prien, from whom the bulls on either side of the conning tower had been kept secret until they had been completed, was both surprised and pleased with the result. Both himself and U-47 were thereafter popularly known as Der Stier von Scapa Flow - "The Bull of Scapa Flow."